PARIS (Reuters) - French President Francois Hollande said on Monday there were many obstacles to reaching a U.N. deal to fight climate change at a summit in Paris in December, with concerns about the strategy of big emerging nations such as India. "Everybody thinks this is a meeting where we will easily find an agreement. 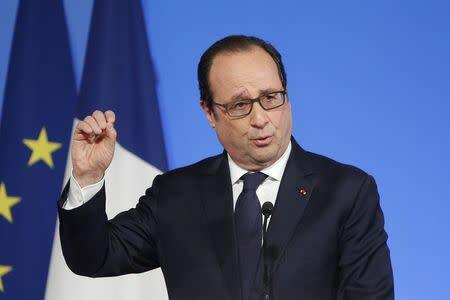 I don't think so," Hollande said in a speech on "green growth" at the Elysee presidential palace. "The more I get into the preparations for this conference, the more I see obstacles," he said. Experts say plans submitted by 34 nations for fighting climate change beyond 2020 would leave the world on track for warming well above the limits agreed with the United Nations. The United States, the 28-nation European Union, Russia, Mexico, Switzerland, Norway and Gabon have so far submitted strategies to the United Nations, meant as the building blocks of a global deal to be agreed at the Paris summit. "Big countries have made rather good commitments, the Europeans especially made a contribution that honours Europe," Hollande said. "The United States said it was now a priority for them." But Hollande said he was more worried about large emerging countries such as India. Prime Minister Narendra Modi signalled earlier this month he would not bow to foreign pressure to commit to cuts in carbon emissions. "We have to show them it's in their interest and that they can, if we share the technologies, reach a certain form of energy autonomy too," Hollande said. March 31 was a first, informal deadline for the plans that are meant to help slow the effects of climate change. Most nations are waiting to submit their plans.